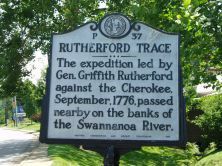 The expedition led by Gen. Griffith Rutherford against the Cherokee, September, 1776, passed nearby on the banks of the Swannanoa River. By 1770 North Carolina’s settlements were encroaching on previously designated Indian tribal lands. The Indians in the North Carolina mountains were primarily farmers who raised some livestock, hunted for game, and traded with white men for the most other supplies. Therefore the Native Americans were both threatened by the white men, but dependent on them, as well. In May 1776 the Cherokee demanded the withdrawal of settlers from the western settlements within twenty days. Knowing that the demand would not be met, the Indians made plans for an attack. Luckily for the settlers, however, traders learned of the Indians’ plans and gave the settlements enough warning to give them time to construct rough stockades. By late July the Cherokee had attacked various settlements along the North Carolina frontier, killing thirty-seven inhabitants. Citizens of the backcountry were alarmed. Griffith Rutherford, brigadier general of the Salisbury District militia, called for volunteers to conduct an expedition against the Cherokee. With militia reporting from several western counties, Rutherford gathered about 2,500 men and enough supplies for forty days afield. From Davidson’s Fort (Old Fort) Rutherford and his men set out on September 1, 1776. They headed through the Swanannoa Gap, towards the Cherokee Valley Towns. The Indians, having gotten word of the expedition, abandoned many of their settlements. Rutherford’s men burned whatever was left behind. 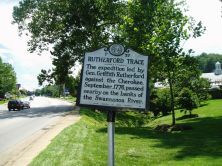 General Rutherford was scheduled to join forces with Colonel Andrew Williamson of the South Carolina militia, in command of about 1,800 men, at the Middle Towns in mid-September. Held up for various reasons, including an ambush intended for the North Carolinians, Williamson and his men caught up to Rutherford at the Hiawassee River on September 26. The two armies divided the following day to begin their return voyages through the Cherokee Middle Towns. Over the next several days, the militia of the Carolinas reduced those Indian settlements to ashes. Together the two armies were responsible for destroying thirty-six Cherokee villages, leaving no homes, crops, or livestock. Rutherford concluded his campaign in early October, having effectively neutralized the threat of the Cherokee in North Carolina. As refugees, surviving over the winter on wild game, nuts, and fruits, the remaining Cherokee signed peace treaties the following year.